I’m a front runner. There, I said it. From the moment Lebron, Bosh and Wade came together and did this, I wanted the Miami Heat to win the NBA title. Bosh, Wade and James all came to Miami under the auspices of taking less money and receiving less individual accolades in order to play better basketball and win multiple NBA titles—now they have their first. I’m a front runner so I was rooting for the Heat over the Mavericks last year. I didn’t care that the overriding narrative was the “good” Mavericks against the “bad” Heat with the fate and conscience of the sports world on the line. Sure Nowitzki showing just how transcendent a player he was on his blazing path to glory was a great story, but I wanted to see the Heat win—I wanted to see NBA science and three NBA scientists succeed in their experiment. And so I was forced to watch as Dirk took and made impossible shots; watched him make herky jerky moves to the basket, jump off one leg, sink clutch driving lay-ups and raise his hands in shaggy triumph. Meanwhile, Wade left it all on the court, knowing the moment, and Lebron disappeared, not fully knowing how to handle history and his great risk. Everyone hates the Heat and no one understood why I wanted them to win so badly. I was asked how I could be such a big basketball fan, so passionate about the game, and still want the Heat to succeed. To most people, the Heat represent everything that is wrong with modern sports and modern society: a group of overprivileged players with short attention spans who came together in order to win an NBA title as easily and as quickly as possible under the thesis that individual talent would overcome team play. The Heat are seen as a clinically created basketball team, something that is unnatural, unholy and thus evil. And so I understand the anti-Heat perspective. The entire premise of my life has been built upon organic moments, trying to live as naturally, as passionately and as truthfully as possible. To that end, the Heat would seem to represent something completely antithetical to the way I live my life or like to believe I live my life. The Heat represent celebrity, glamor and a lack of grit or real-life principle. Instead, it seems that the Thunder—who built their team from the ground up around young, likeable superstars who seem like they could have lived one floor below you in your college dorm or have been that focused, athletic neighbor you sometimes convinced to get drunk with you but who would never smoke weed—and Kevin Durant would represent that “organic” natural progression to success. However, that’s not what I’m interested in when it comes to sports. When it comes to sports I want the best story, I want the outcome that stirs some kind of emotion from deep within me, that emotion that is a mixture of not being able to comprehend what these larger-than-life athletes are going through or achieving, yet at the same time feeling connected to the very human emotions they are constantly going through. When it comes to sports I want to feel the history, I want to feel like I am watching an athlete or team understand a moment, reach into the swirling mists of daily history, and form a legacy, something concrete and definite. Sure, that something definite will one day be swept up again in the turbulent, circular tide that is history, but at least its there, and at least for that moment, someone or some-team understood how to form it. There is no doubt that Lebron and the Heat winning the NBA title this season was the best overall storyline. The Thunder are a likeable team with plenty of great players, with a great attitude and an insane amount of talent and youth, but was that really the story you wanted? Did you want all those young guys to win a title already? I’m not an ageist in the slightest and I am not fully wedded to the Jordan “hardship to success” narrative—Larry and Magic won titles in their first and second seasons respectively. The Thunder winning the title was not the best story; it did not stir anything in me. The Spurs winning would have been a fine story, the final topping on the fascinating combined psyche and atmospheric will of Tim Duncan and Greg Popovich’s marriage. If the Celtics had won the title, it would have been a great story as well. The admirable and courageous Paul Pierce, the fierce and prideful Kevin Garnett, the noble and elegant Ray Allen and the enigmatic and brilliant Rajon Radon willing themselves to a hard-fought title that would have been the crowing achievement for their legacy as perhaps the team whose formation helped usher in this current golden age of the NBA. That last story stirs something in me but only because I love Rondo so much and only because I love the NBA so much and thank this current iteration of the Celtics for what they have contributed to the NBA’s overall success. No, the best possible outcome was the Heat winning the title. Now we are forced to live in a world where Lebron is successful. A world where Lebron has successfully eradicated his Richard II and Henry IV sense of manifest kingship and has pulled a Prince Hal-Henry V transformation—he went through all levels of basketball society and is now ready to assume the role of the King. The Heat as a team finally learned how to play a more fundamentally sound brand of offensive basketball while playing absolutely inspiring defense. The amazing thing about it is that they seemed to learn as the Playoffs went along. After Bosh went out during Game 1 of the Pacers series and Wade bottomed out during Game 3 of the same series, the Heat had to rebuild themselves on the fly. Wade and Lebron slowly learned how to improve playing with and off each other while still hauling a “hero’s” burden of the scoring in order to compensate for Bosh’s absence. They willed the team to defeat a Pacers team that was over-matched and talked a tough-guy’s game that they weren’t quite ready for. During the Celtics series, the Heat were tested mentally and physically by a Boston team that just wasn’t ready to die—they had to vanquish the Celtics and it required role players like Battier, Chalmers and Haslem to not be afraid and to try and contribute the little things that they are each capable of contributing, but to absolute perfection. All of that set the stage for the Finals, where each game the Heat had a different player emerge to help fill in that space off the box score called “intangibles.” In many ways, this Finals was the ultimate “Shane Battier series.” The teams were evenly matched talent wise, but you needed to have those heady players who make the weird, lucky plays go your way. The Heat had that in the 2012 Finals. The Heat also played a better brand of basketball. Carles wrote yesterday that the Heat still do not play a beautiful brand of basketball. That statement is true to a degree, but he is a Spurs fan so there is a bias present and plus he isn’t completely correct. If you watched the Heat during the Finals, you saw a team that started to increasingly resemble last year’s Mavericks team after each successive game. Last night’s clinching game was the culmination. There were countless moments in the third and fourth quarters where the Heat made the extra pass, where Bosh or Wade made the smartest cut and where Lebron got great post position and dictated the offense the way the basketball world has always wanted him to. The Heat have been struggling and working to get to that point of execution for two years. We have watched with great anguish as they struggled because we wanted so much more, we knew what science was capable of and we wanted to see it become real. Last night we perhaps saw the beginning of the Heat understanding how to play their best brand of basketball. Isn’t that the most compelling story? Thunder will be back to the Finals and so will the Heat. Many people will say that there is an asterisk on this title because the Bulls were without Rose and because the Spurs would have matched up better against the Heat if they had played in the Finals. But those things didn’t happen. Rose was hurt and the Spurs lost. I’m tired of looking ahead to things and I’m tired of wondering what could have been—those two tendencies of human thought can haunt me in my dreams. This is a moment of history I want to appreciate. Last night I reveled in the Heat’s victory. 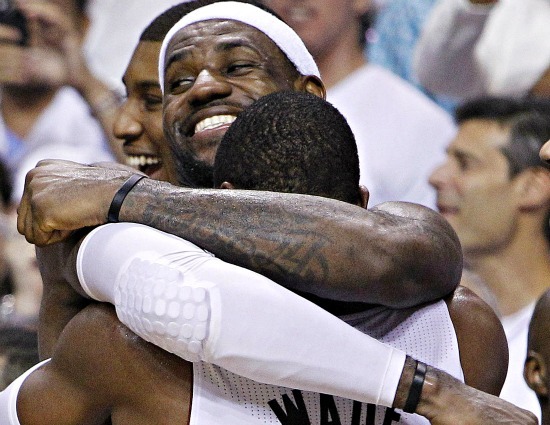 I wanted to see the embrace between Lebron and Wade, two friends who didn’t want to let each other down. I wanted to see the much maligned Chris Bosh jump and grin like an introspective goofball. I wanted to see Battier stoically and tastefully grin with contained contentment. More than anything, I wanted to see Lebron let his guard down. I wanted all the Shakespearean and historical themes and expectations to fade away and just watch a 27-year old enjoy a moment of success with his teammates and friends. Wasn’t that the most compelling story? After twenty years of my NBA lifetime, I know for certain that there are three things that I will always have complicated feelings for: Michael Jordan, the Miami Heat and Rajon Rondo. Last night, I got to see the Heat succeed and I got to ruminate on how deeply I felt connected to them even though I have no vested rooting interest in their team or in the city of Miami. My rooting interest in the Heat is based on hope, possibility and literary tropes. If that keeps me up past one in the morning thinking about Shakespeare, Dwyane Wade’s kids and Lebron, then I’m perfectly fine with being a front-runner.